I had grand plans today. Was going to head out and run some errands, pick up some groceries for Christmas Day brunch (my nephew and I are making pasta frittatas), head over to get some custom cards printed and maybe catch up with a few people before the weekend. For the past 2-3 years we have been pretty fortunate with the winter weather here. Not much snow prior to Christmas (if at all) and the temperature has been above seasonal most of the time. It's amazing how quickly I can change plans when a little bit of snow hits the ground. A luxury I was awarded today by not procrastinating for once. So I took some time wrapping gifts this afternoon (finished my shopping a couple days ago), started reading one of the two books I have planned for the break and oh, there was an Austin Powers marathon on....must watch. They still make me laugh. I thought I'd share the last couple items to cross my desk before the end of the year. The past few months have been very eventful for me hobby-wise and I couldn't be more happier. I certainly enjoy things more when there is activity going on in my card collecting world. 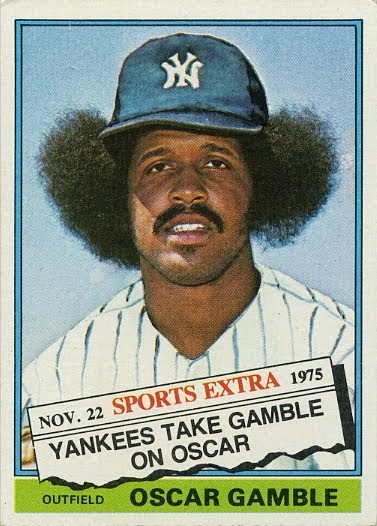 Today, it's yet another Oscar Gamble card....and to celebrate his birthday to boot (was a couple days ago). Yet again a huge assist to a fellow collector whose US mailing address I've used more than my own this year. Thanks Kevin! It's the second #WalletCard 1/1 to show up online and the second one I've managed to win with relative ease. Shhhhhh....don't tip anyone off. 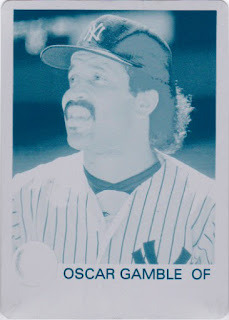 When it comes to my Oscar pc, I feel as though I'm gauging my success on what 1/1s and buybacks I can land - when I see those pop up...my radar is fully locked. I've been much more relaxed with the regular base or higher numbered parallels (I feel as though I can obtain them pretty much anytime I'd like) and clearly my master checklist proves this point. So what are my hopes for the upcoming year with this project? None. I have had zero expectations and plan on continuing that trend. I want this to be a project built on fun and enjoyment and that is exactly what it has been.